This nine patch quilt block has all sorts of fun stuff going for it. There are half square triangles and lots of flying geese in an assortment of colour combinations. Lastly, by using quarter square triangle cut pieces, an interesting centre patch is created which deviates slightly from the usual square in a square patch. Burning Star is a name I gave to this block. I had discovered a line drawing of the block but with no name and so I decided that this would make a lovely "fiery" star in a night sky. I also like to use dark fabrics for the background from time to time. 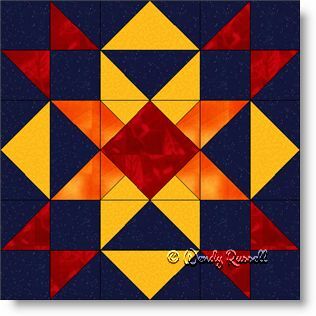 Most quilts use light fabrics and it is a nice change-up now and then. The sample quilts illustrated are both made with on point settings, but different end results emerge with a bit of imagination. Why not see where your imagination takes you?